Akram Khan’s Giselle returns to Sadler’s Wells Theatre, London on 20 – 23 September 2017 after its successful performances last year. Performed by English National Ballet, Akram Khan brings the 21st century’s context into the ballet of the Romantic period in the 19th century. The simplicity of movement, costume, and set design distinguishes this remake version from the original, yet very mesmerizing. In contrast with the original version, Khan’s Giselle adapts the romantic story with the abstraction of this globalization era by replacing the community of peasants with migrant workers. Migrants and refugees that have become one of world’s main challenges as well as human inequality are the main issues in Khan’s version. With no white tutus on stage as they are the iconic costume of the romantic-era version, costume designer Tim Yap creates simple and minimalist style of the costumes that portray beauty and sadness together. The renowned choreographer beautifully combines classical ballet and contemporary dance with influence of his dance training background, the Indian classical dance form Kathak. The dominating repetitive movements danced in unison gradually build up the strong energy. Khan’s presence in the contemporary dance world, particularly in the West, has certainly borne fruits to both traditions. Not only that he is able to continue questioning and challenging each tradition, Ballet and Kathak, but also to provide a platform to renovate old ideas as well as integrating both mind and movements in the 21st century global world. A cross-cultural collaboration is not a new phenomenon in the history of the Arts. From the 9th century Andalusia to Bartok’s folklore to Brazilian Jazz are the concrete proofs. In fact, collaboration in the Arts have been seen as a need or even a necessity; it’s a medium to communicate and to express our emotions and ways of life with languages of the arts (music, dance, painting, etc) that has no cultural, social and political barriers. If there was a ”flaw” in the performance, it certainly was not about the story, choreography, costume or dancing; instead, it was the unwanted interruption in the early minutes due to the injury underwent by the dancer who played the Albrecht character. The performance was stopped for cast change; in about ten minutes the show was restarted from the beginning. Other than that, this renewed Giselle is nothing but a stimulating and an inspiring piece. Ballet teacher at Namarina Dance Academy, and also a dancer at Namarina Youth Dance in Indonesia. She is currently pursuing a Master degree in Dance Performance at the Trinity Laban Conservatoire of Music and Dance in London, UK. Looks like a really interesting piece of work. 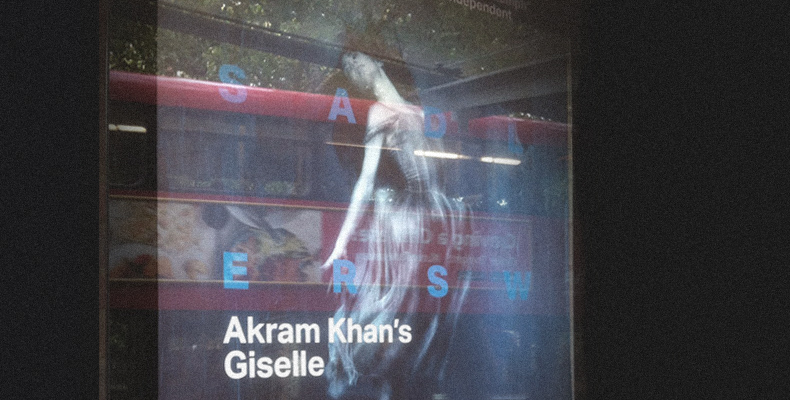 I can only see Akram Khan’s work through YouTube, and I am really excited when I heard that he’s remaking the “Giselle”. Didn’t know that this performance is related to today’s context, it makes me want to watch it even more. Too bad I live in a different country. Hope I can see this version of Giselle someday. Hello Faruk H and Gilang S, thank you for sharing. Historically, Arts have always been the power to challenge problems human has faced. Renewing the old form is necessary to keep traditions alive, and also provide new solutions to answer problems we are facing. Great to hear today’s art is still functioning to renew the old one and challenge current problems in the world. Keep up the good work guys! It’s always interesting when two cultures “make love” to each other, especially to confront world issues. Imagine, without cross-cultural collaboration like this, maybe both traditions wouldn’t have a chance to develop.